China in Africa: The Real Story: Guest Post - Year of the Dogs? A new boom and bust for Chinese construction in Africa. Guest Post - Year of the Dogs? A new boom and bust for Chinese construction in Africa. This Guest Post is by SAIS PhD student Yunnan Chen. 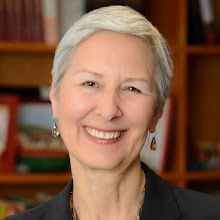 She previously worked as a Research Officer at the Institute of Development Studies at Sussex University. She has an M.A. in Political Science from the University of British Columbia and a B.A. in Politics, Philosophy and Economics from the University of Oxford. The fall in global commodity prices since 2014 has negatively impacted many resource-exporting economies in Africa, with implications for the China-Africa relationship. Since 2014, total volumes of China-Africa trade have declined steeply. 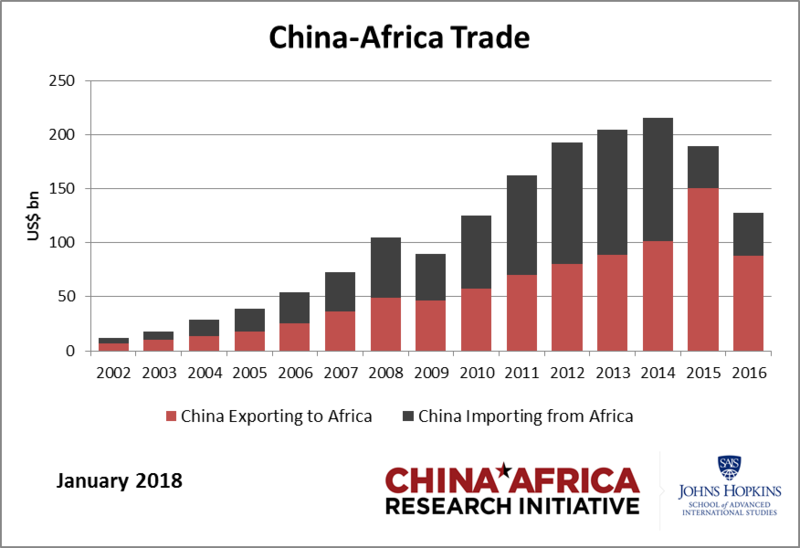 African exports to China fell dramatically between 2014-2015, and while Chinese exports to Africa continued to rise in 2015, this trend appears to have also reversed: our most recent year of data shows that African imports of Chinese goods have also fallen. This may indicate the effects of low commodity values, as well as the problems of exchange rate crises in many large economies in Africa, which have impacted economic demand and buying power for Chinese goods. Interestingly, this trend appears to have also affected the market for Chinese contractors. 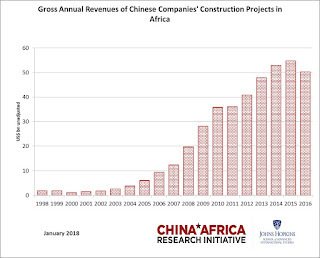 Our new 2016 data for labor and contract revenues (below) illustrates what appears to be a downturn in African construction markets, with consequences for Chinese SOEs and private contractors on the continent. Our data for contractor revenues come from Chinese government reports published in China’s annual statistical yearbooks. 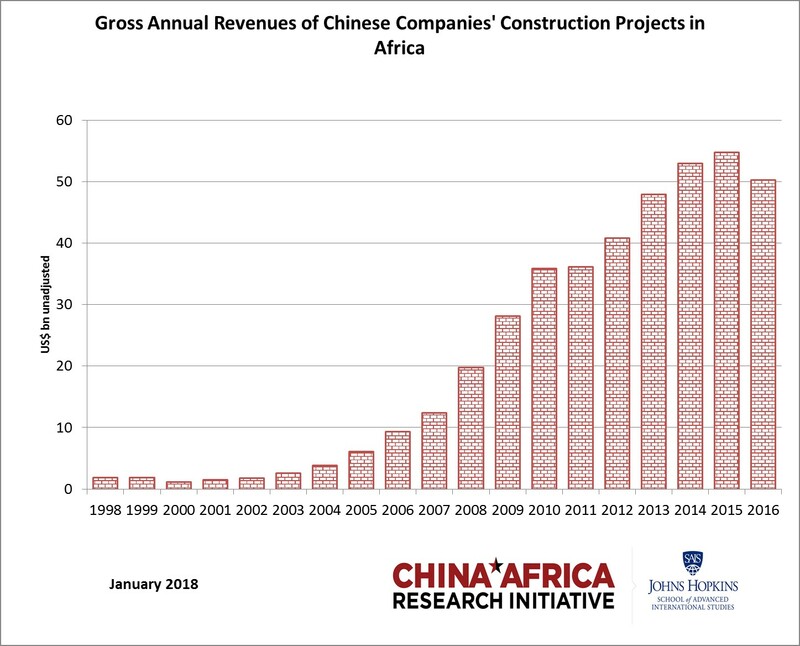 The data since 2000 have shown year-on-year growth in Chinese contract project revenues in Africa. In 2016, the most recent data show total annual revenues to be $50bn. However, this is a steep downturn of $4bn from $54bn USD in 2015. Aside from a slight decline in 2011 (see chart), this is the first year since 2000 that Chinese contract revenues in Africa have fallen. The top five countries for contracts remain Algeria, Ethiopia, Kenya, Nigeria and Angola, which account for 49% of all reported annual contract revenues in Africa. Correlating to the decline in contractor revenues, we also see a similar decrease in the numbers of Chinese workers in Africa in 2016. 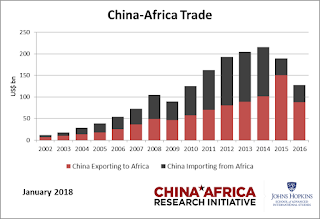 Data for this also comes from official governmental reports—which encompass only the Chinese workers who arrive in Africa for specific projects, and do not give figures for traders, private entrepreneurs and small investors who come to African countries independently. At the end of 2016, there were over 227,000 Chinese workers in Africa, according to official sources -- with Algeria hosting 40% of all Chinese workers, close to 100,000. This is a steep decline from 2015—within a year, 36,000 Chinese workers left the continent. As contract revenues decline, it is not unexpected that employment opportunities for Chinese workers overseas are also tighter. In 2016, the top 5 countries with Chinese workers were Algeria, Angola, Ethiopia, Nigeria, and Kenya, correlating with the top 5 for contractor revenues. These 5 countries account for 65% of all recorded Chinese workers in Africa at the end of 2016. This shows a slight shift from the previous year: Equatorial Guinea and the Republic of Congo have fallen out of the top 5 of countries with most Chinese workers. 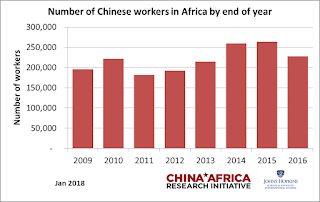 Angola and South Africa have also seen steep declines in Chinese workers—respective drops in 33% and 86%—that disproportionately outweigh any decline in revenues. Some of the countries that have seen the largest drops in Chinese workers have been in conflict-afflicted states: in South Sudan, Chinese workers decreased from over 5800 in 2015 to 420 in 2016, and in the Central African Republic, 667 workers fell to only 39. This also suggests the salience of security and conflict concerns, not just economic trends. Though falling numbers of Chinese labourers can also be accounted in completion of large projects, or wider trends of labor force localisation, it is clear in the shifting economic relationship between China and African economies, that Chinese firms and economic actors are also feeling the effects of Africa’s economic downturn.